Toyota is working on two hydrogen-fueled vehicles. 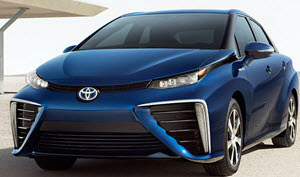 The one pictured here is called the Mirai or the FCV (not sure which is the official designation). They also plan a hydrogen-powered limo. Hydrogen is the darling of the non-thinking anti-carbon “environmentalist” crowd. It’s a notoriously difficult-to-contain gas that is the most potent ozone-depletion agent known to man (and guess where it goes when released to the atmosphere). It’s more hazardous than gasoline. And the cost-per-unit energy is so bad that the only real purpose of hydrogen that I can see is to make ethanol look good by comparison. The problems with hydrogen are rooted in various laws of physics which are unlikely to be overcome by any amount of clever engineering. Non-thinking, for sure. As much as I like Toyota (I own a Tacoma and a Camry, both of which are high-quality vehicles), this significantly lowers my opinion of the company.